Although an Ab Wheel is often associated with a corny infomercial, it’s actually a very legitimate addition to your workout routine. When used properly an Ab Wheel is one of the best workout tools to add strength to your core. An Ab Wheel rollout is a form of anti-extension core training. Basically, when you roll forward, your abs are forced to put in extra work to keep your back from arching into extension. The whole concept is similar to a plank but actually much harder, and more beneficial. There are, surprisingly, some very expensive Ab Wheels on the market, despite not appearing to be a very complex device. We think that price doesn’t necessarily equate to better quality when it comes to an Ab Wheel. That’s why we’ve scoured the Internet for the best Ab Wheels available for under $30. 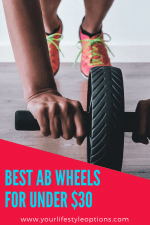 Take a look at the best Ab Wheels that you can purchase on the cheap so you can ensure you’re getting the most bang for your buck. 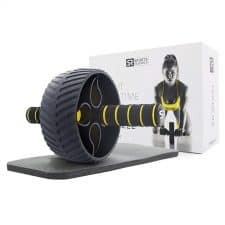 This Ab Wheel from SKLZ is our top pick based on its combination of quality and features. You’ll find that there are tons of generic off-brand Ab Wheels on the market but, in this case, we feel it makes sense to go with a trusted brand. SKLZ is based out of San Diego, CA and has been making high performing sports equipment for decades. In terms of specs, both Ab Wheels weigh less than 2 lbs collectively and can easily be tossed into a duffel bag to take to the gym. The wheels are made of semi-soft urethane (similar to the wheels on roller bladaes) and there are bearings built into the handles, a nice upgrade over bushings which most Ab Wheels use. In terms of overall weight limit, we read numerous positive reviews from people weighing 285 lbs and above that had no issues using these Ab Wheels to their full extent. This Ab Wheel also separates itself from the pack by being able to go in different directions, not just forwards and backwards. This changes the muscles that get used and allows one to target different muscle groups, such as the chest, pectoral muscles and shoulders. As an added bonus it also comes with a nifty training guide. 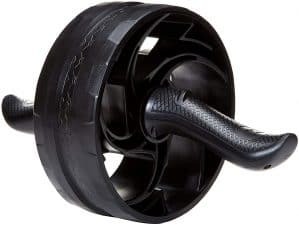 Despite being branded an AmazonBasics product, this Ab Wheel gets rave reviews and can typically be found for less than $25. Key features include ergonomic grips, is lightweight at 2.1 pounds, and is backed by a 1-year warranty from Amazon. Several users commented on the sturdy and substantial construction of this Ab Wheel, especially the wheel itself and the steel pipe axle. There are also positive comments regarding the ergonomic shape and angle of the handles which are easy on the palms and take pressure off the wrists. This means you can use the Ab Wheel under your abs give out on you, not your wrisits. 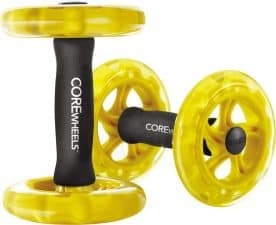 There is minor assembly required and a few people mentioned that they wished the handles had softer grip on them but, overall, this is a great option for working out your core. Our next runner-up pick comes from Sports Research, also a noted name in the sports equipment industry. This is our recommended Ab Wheel for those who prioritize soft, cushioned grips. Plus, as an added bonus, this Ab Wheel also comes with pads for your knees. It also has a wide base for curving left or right which can assist with working different muscle groups. On a down note there were several comments about the unit not being as strong and sturdy as other Ab Wheels on the market.